Pou·tine (po͞oˈtēn) noun Canadian: a dish of French fries topped with cheese curds and gravy. Authentic poutine should not be confused with “fries and gravy” or “loaded fries.” Until 2015 poutine was virtually nonexistent in Western New York. It all began when Jake and Kostantine, our two young, but experienced Canadian restaurant owners acted on a hunch that Western New York held a niche market for authentic Canadian poutine. (We should mention here that the hunch was brilliant!) Location research and the advice of Marc, our “grizzled” marketer (who later joined us in ownership) led us to Buffalo’s hip and artsy Allentown district, which is where we opened the doors to Allen Street Poutine Company in March of 2015. We want you to be part of our family, so the next time you’re in share your experience by using #poutineco and spread the poutine love! Chicken, spicy rancho sauce, onions, green peppers & cheddar cheese. Yelpers favorite! 6 oz ground fresh in-house burger topped with lettuce, tomato, pickles, onion, ketchup, mustard on a brioche roll. 6oz ground fresh in-house burger topped with lettuce tomato, salsa, sour cream, tortilla chips & lots of cheese. Ask to spice it up with some jalapeos. 6oz ground fresh in-house burger with lettuce, tomato, red cabbage cole slaw, homemade bbq sauce, pulled pork & bacon. French fries, mac salad, cheeseburger, spicy red sauce & bread. French fries, mac salad, cheese curds, gravy, spicy red sauce & bread. Triple chocolate brownie ice cream topped with chocolate fudge, a brownie, whipped cream & chocolate sprinkles. Cake batter ice cream with rainbow sprinkles & chocolate sauce, topped with whipped cream & a cupcake. Peanut butter-chocolate ice cream with crushed Reeses Pieces & Reeses Peanut Butter Cup ears, drizzled with chocolate & caramel sauce. 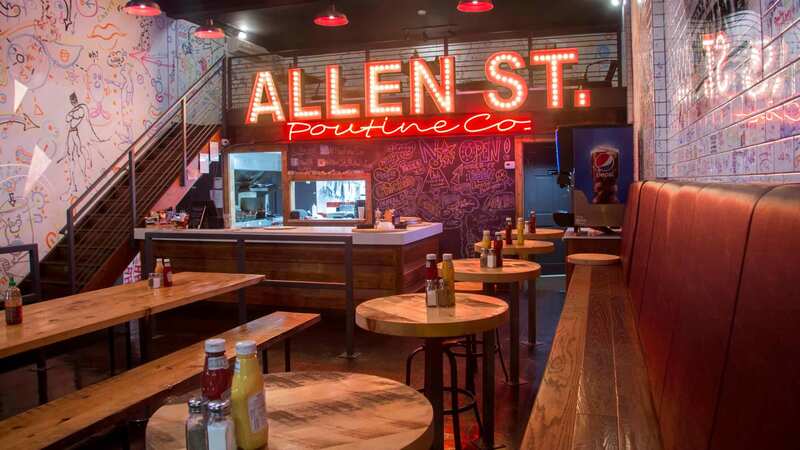 11:30 a.m. – 11 p.m.
11:30 a.m. – 4:00 a.m.
11:30 a.m. – 1:00 a.m.
Allen Street Poutine Company was the first poutinerie to open in Buffalo, New York. And ours is a different kind of restaurant — a hip, Canadian-influenced eating establishment with a unique fare that attracts patrons of all ages, from both sides of the border. Seasonally, patrons can eat outdoors on our covered patio. Word of Allen Street’s opening quickly spread via social media channels and through a few glowing reviews from Buffalo publications. Our social media followers number in the tens of thousands — and we love talking to our “social” audience by engaging followers with restaurant happenings, contests, new menu options, poutine education and a little Canadian culture. We cut our fries in-house and prepare them using the Belgian Frites method (the key here is cut thin and fried twice). Our fries are fluffy on the inside, crispy on the outside and are served smothered in our homemade beef or vegetarian gravy and locally produced cheese curds. All of Allen Street’s ingredients are obtained from WNY vendors. Outside of our mouthwatering poutine though, what you’ll remember after visiting Allen Street is our fun atmosphere — we really like to have fun. We house a full-size (free) Ping-Pong table upstairs and host events like our annual Poutine Eating Contest and South Park Trivia nights that will keep you laughing whether you’re participating or just watching. And guests are encouraged to leave messages and artwork on our subway-tile walls — we even provide the markers. Patrons enjoy this so much that we have to clear the walls every few weeks to make room for new messages. We like to share the interesting ones on Facebook, Instagram and Twitter. And our staff is the best (just check out the testimonials that regularly appear on our walls and review sites like Yelp and TripAdvisor) — but you won’t need to read it, you’ll experience it yourself. For the uninitiated, poutine is a savoury adventure made up of French Fries, Gravy, and Cheese Curds. Where did poutine originate from? Almost all poutine connoisseurs agree that it was first introduced in Quebec, Canada in 1957. However, when it comes to who first came up with this amazing concoction the answer remains debatable. Considered the ‘national food’ of Canada, today you can find it in pubs, restaurants, fast-food chains and even poutine specialty shops. Every day tens of thousands of servings are consumed by hungry Canadians and adventurous tourists. How do we make our fries? 1. Thoroughly wash whole potatoes. 2. Hand cut into beautiful fries using our wall-mounted Cutter. 3. Wash the cut potatoes in cold water. 4. Dry the potatoes off. 5. Dip the delicious pommes frites into hot oil. 6. Soak up the excess oil. 7. Drop the fries into hot oil for a second time until they are golden brown and amazing. Where do we get our cheese curds from? Ellsworth, Wisc. (the cheese curd capital of the cheesiest state in the U.S.) before settling on Corfu, N.Y. based Yancey’s Fancy. We offer two types of gravy. A traditional beef-based recipe as well as a vegan/vegetarian recipe. As for what goes into our gravy…it is a top secret recipe that can’t be shared or even spoken about. Sorry! "Eating Niagara: Heading Back to Buffalo"
"Poutine Palaces: 10 Great Places in Upstate NY for Beloved Canadian Staple"